To celebrate the 75th birthday of one of the most respected artists in contemporary bluegrass, a special 90-minute set, “Del McCoury Band with special guests Lee Ann Womack and Keller Williams”, will take place on Saturday, October 4 during the Wide Open Bluegrass festival. 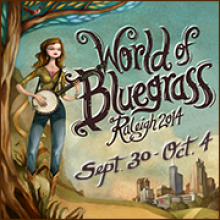 Wide Open Bluegrassis part ofthe International Bluegrass Music Association’s World of Bluegrass event, which takes place September 30 – October 4 in Raleigh, North Carolina. Artists that have been previously announced for Wide Open Bluegrass, which takes place October 3-4, include Ricky Skaggs & Bruce Hornsby with Kentucky Thunder, Hot Rize (with Red Knuckles & the Trailblazers), Yonder Mountain String Band, Gibson Brothers, Steep Canyon Rangers, Jerry Douglas presents The Earls of Leicester, Bela Fleck & Abigail Washburn, Balsam Range, Lonesome River Band, Chatham County Line, Noam Pikelny & Stuart Duncan, Della Mae, Russell Moore & IIIrd Tyme Out, The Grascals, Junior Sisk & Ramblers Choice, Special Consensus, Town Mountain, The Deadly Gentlemen, James King Band, Larry Stephenson Band, Mustered Courage, The Roys, The Davidson Brothers, Jesse McReynolds, Bobby Hicks, Sierra Hull, The Kruger Brothers with Kontras Quartet’s world premiere of new concerto “Lucid Dreamer” and the Wide Open Jam, featuring the superstar lineup of Sam Bush, Bela Fleck, Jerry Douglas, Edgar Meyer, Bryan Sutton and Stuart Duncan. Womack’s performance with Del McCoury will come at the end of a busy week for the Grammy winner at World of Bluegrass 2014. The country vocalist will join fellow Grammy recipient, musician Jerry Douglas, to host IBMA’s 25th annual International Bluegrass Music Awards, scheduled for October 2 at Raleigh’s Duke Energy Center for the Performing Arts. The Way I’m Livin’, her much anticipated roots music project on the Sugar Hill label, continues to receive positive notice from esteemed media outlets like The Wall Street Journal, RollingStone.com and USA Today. Those wishing to obtain tickets for the ticketed portion of Wide Open Bluegrass (which takes place at Red Hat Amphitheater and Raleigh Convention Center Ballroom Stages), Bluegrass Ramble Showcase passes, IBMA Business Conference registration, IBMA Award Show tickets and hotel reservations should go to IBMA’s website, ibma.org. Single day general admission for the ticketed portion of Wide Open Bluegrass starts as low as $50, with a three-day Bluegrass Ramble pass available for $75. Additional details and pricing information are available at the website. Performers for the free Street Festival portion of Wide Open Bluegrass will be announced in the coming weeks.